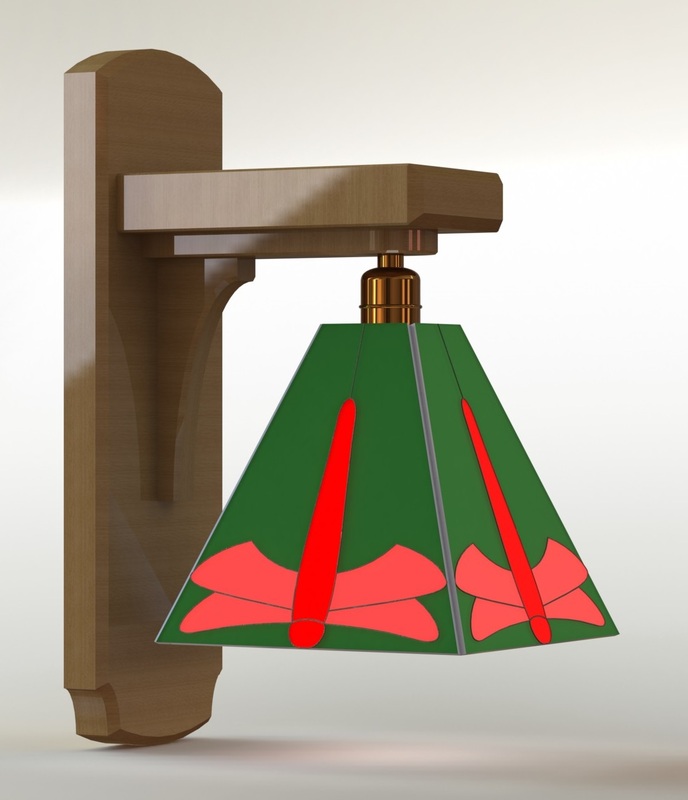 I spent some time last night updating the CAD model for the Arts & Crafts sconce I want to build. 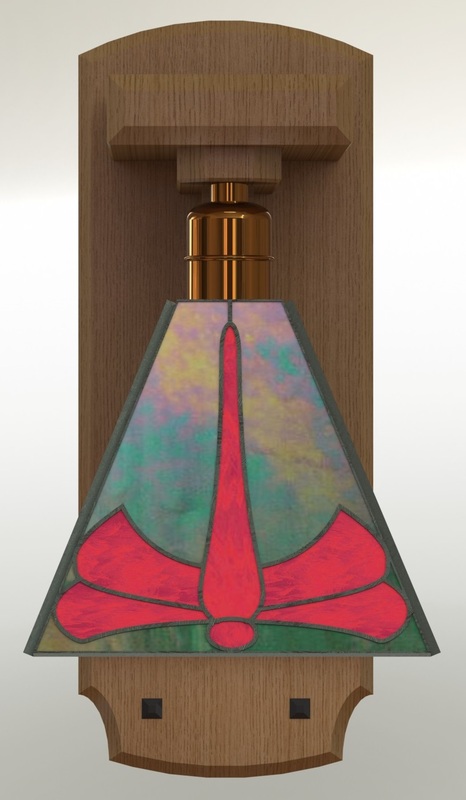 All of the changes were to be able to render the lamp shade so it represents the actual look of the stained glass I plan to make. Modeling the basic shade is simple, it’s just four trapezoid-shaped panels joined together. 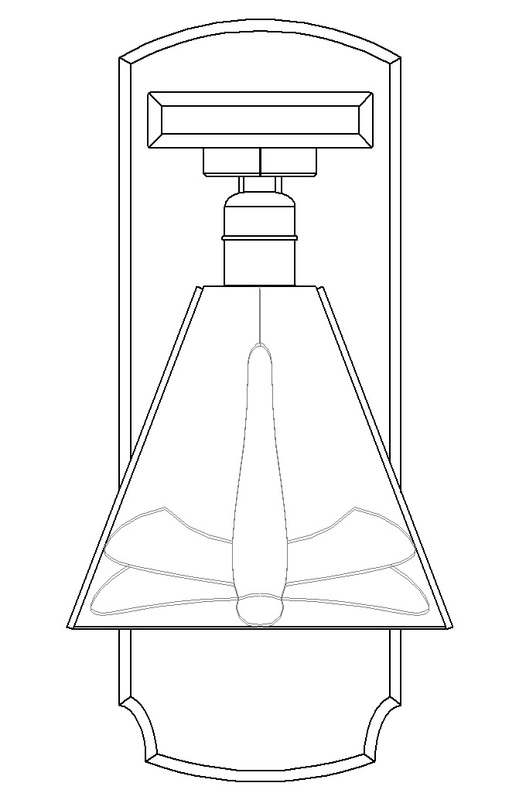 Drawing the layout for the glass — the dragonfly outline — is pretty simple too. It’s just a series of splines that I have to tweak to get the shapes I want. To get to a model of the glass that I can render I have to add in the raised solder seams, and I have to trick the model into thinking it is ten separate pieces of glass so that I can attach different rendering properties to each. Not hard, just time consuming, and the software is slightly quirky in this area (or maybe I don’t fully understand how the new rendering engine in this version is supposed to work). Anyway, here is what I came up with. Not perfect, but it gives you a pretty good idea what the finished sconce is intended to look like, which is the whole point. 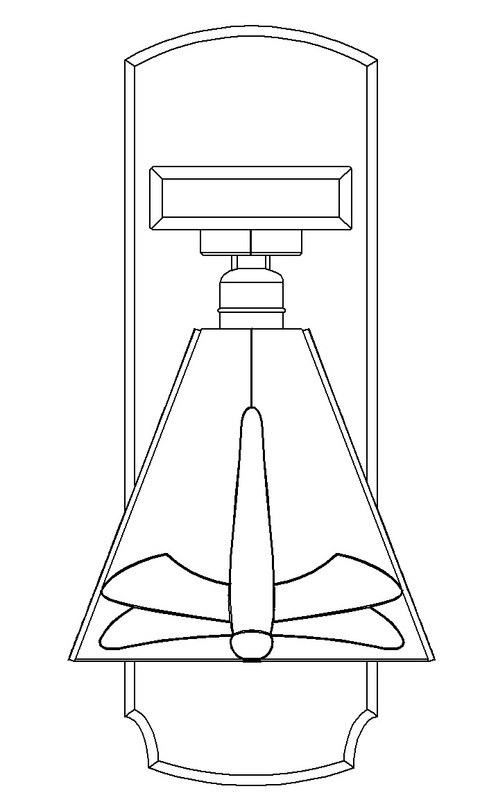 I’ve been tweaking my design for a “mission style sconce” today, and I think I’m happy with the current design. I need to print out a full size drawing at Kinko’s once more to verify the size, but I think I’ve got it. If you want plans, you can download them here. I’m going to start cutting parts for it this weekend. The original version was just a little too big for the room when I printed it. I narrowed the wall plate, and shortened it, shortened the horizontal arm, and changed the size of the glass share (and dragonfly contours) multiple times. I added some ebony pegs to the bottom. I think this is “final”. I did an updated rendering, but just with “plain glass”. To render it with the actual stained glass design requires some extra CAD work to model the lead beads and split it into separate pieces so I can have a different rendering plan for each one. I’ll do that later as an exercise — I want to wait to make sure I don’t need any more design changes first. 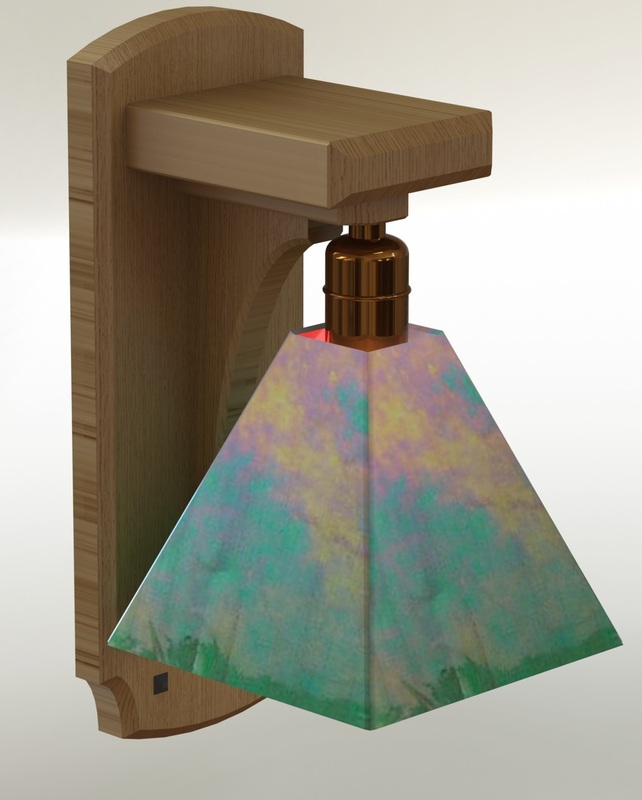 The color of the glass in the rendering is from the preview picture of the actual glass I plan to use for the background of the sconce. I have some of this, and a nice iridized red/white wispy glass ordered already. One of my ulterior motives with woodworking these days is to slowly fix up my house. It’s a nice house in a desirable area, but the demands of working and raising a family have distracted money and attention elsewhere the past few years. I eventually want to make new kitchen cabinets, and some other smaller remodeling projects. While I’m making this Byrdcliffe-inspired cabinet for the guest room I realized that the lighting in that room isn’t right. There isn’t any built-in lights in the room, the wall switch controls a plug. I’m not a big fan of overhead lights (and my wife absolutely hates them), so the lack of an overhead light ins’t a big deal in itself. 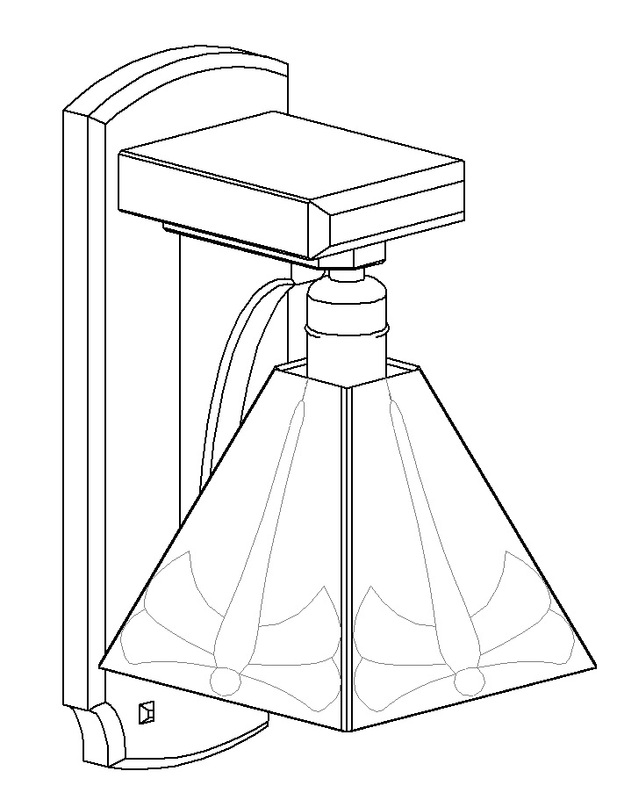 My idea is to make a pair of sconces that can hang on either side of the main window in the room, and wire them into the wall switch. That means tearing into the drywall to get the wires where they need to go, but we’ll cross that bridge when we get to it. 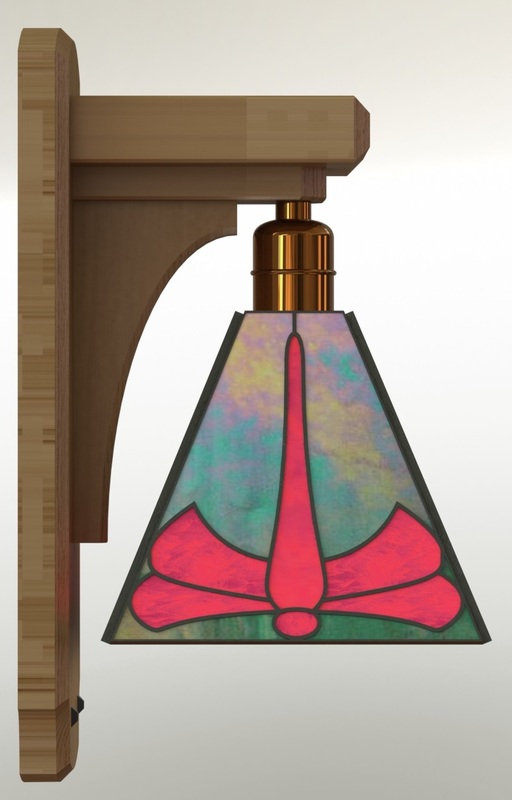 Since I’m using a Dard Hunter design for the glass in the cabinet door, I decided to use his art as inspiration for the sconces too. 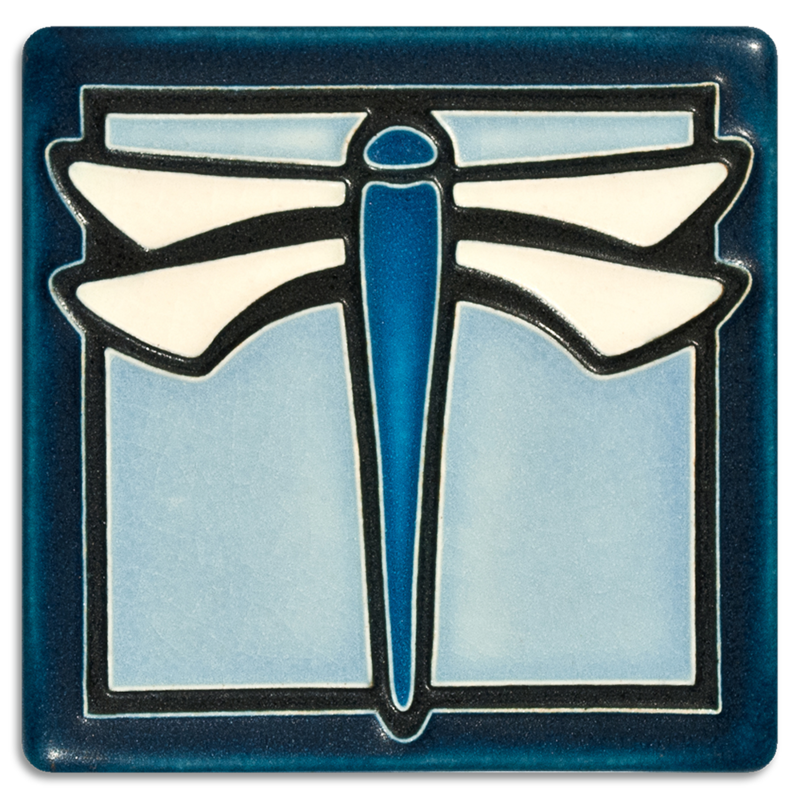 I thought this dragonfly design could be interesting in a sconce. 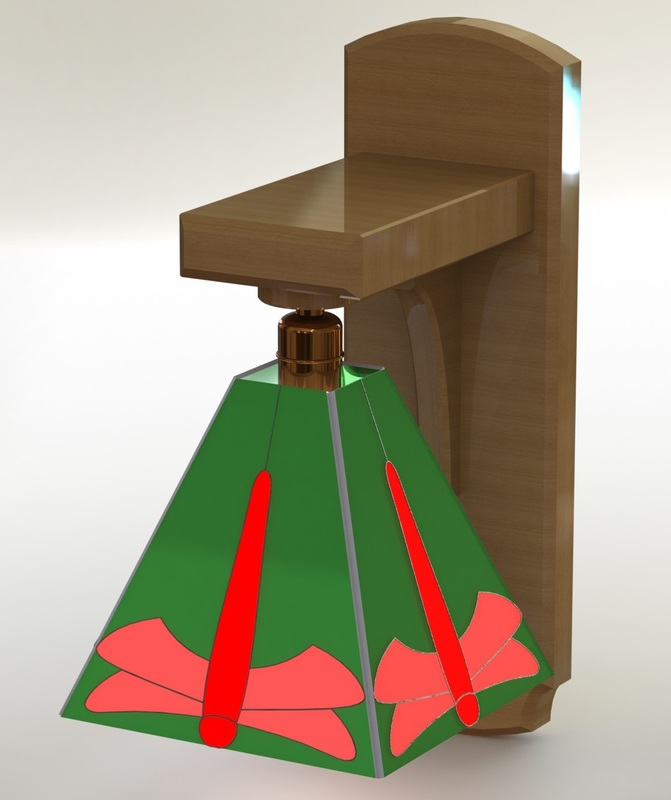 I modeled my idea in CAD, basically a simple Oak L-bracket with a corbel, and a stained glass shade. I’m not 100% satisfied with the design, but the way this works for me is I need to take a cut at the design and then come back to it later. Generally I see things that I can tweak to make it better. I also find that it’s too easy to get the scale wrong on this sort of thing – so I’ll print out the pattern full-scale at Kinkos later this week so I can hold it in place in the room and make sure the size is OK. I printed the pattern for the glass and it seemed too big. The dragonfly body was also a bit off (and a bit too phallic, pfrankly) so I made a few changes. I shortened the wall bracket, and pulled the shade closer to the wall. I also tweaked the body of the dragonfly, and shortened the shade. I like it better. I’ll print out a scale drawing of the whole contraption tomorrow and hang it on the wall to stare at. I didn’t re-do the renderings – maybe after I’m sure this is the right scale. I’ve been doing some finish samples on scraps of White Oak to figure out what how I want to finish the cabinet. I’d previously done an experiment with dyes and gel stains that gave decent results. My only complaint was that the ray fleck figure wasn’t as dramatic as I’d hoped. I decided to try fuming some scraps to see how that would work. 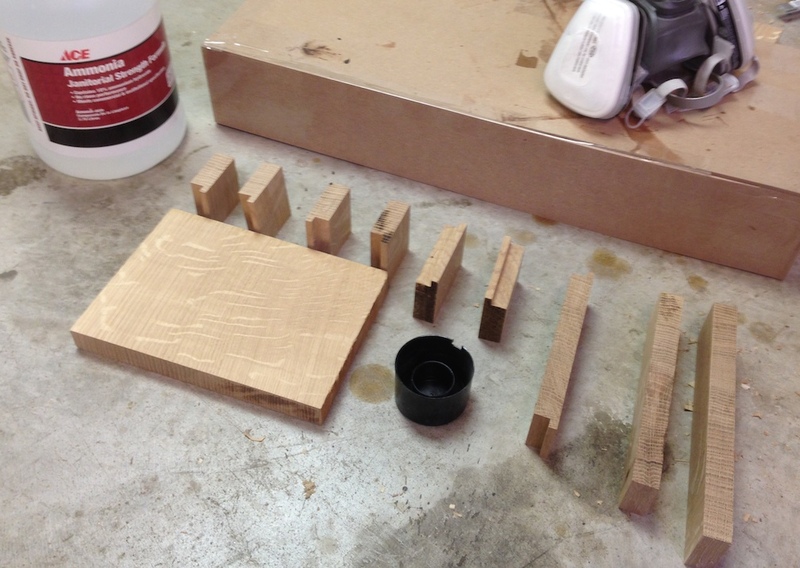 I set up some offcuts on the floor and made a box out of 1/8″ MDF scraps and packing tape for the fuming chamber. I’m using Janitorial-strength Ammonia. I know there are stronger (and weaker) concentrations, this is what I could find at the local hardware store. I pulled a sample at three hours, another a 7 hours — and then I went to bed. The next sample came out this morning before work, at about 17 hours. I left a few pieces in until this afternoon, clocking in at 24 hours. This pic shows the range from zero to three, seven, 17 and 24 hours. The color is progressive, although it’s not as clear in the photograph as it is in person. 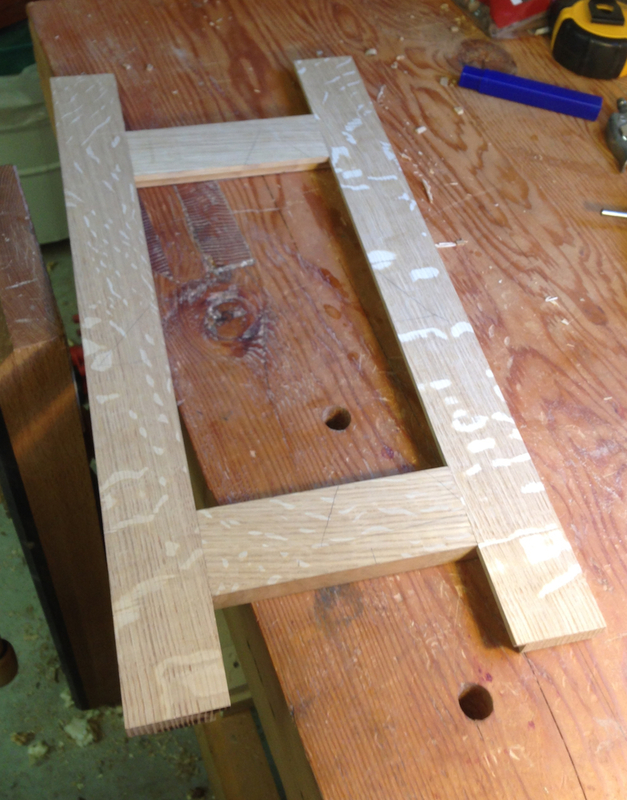 I cut the “horns” off of my glued-up door and carefully planed the four sides until it was a snug fit into the opening. I have a pair of non-mortise hinges I may use on this, but until I’m sure I’m not going any further with fitting the door. I also need to figure out a stop block for the door to close against, and some sort of catch. Maybe a small block of wood with a rare earth magnet, although I’m considering making a a “Krenov catch”. Needless to say, I’m very happy with the fit. My next step is to sort out the hardware and and clean up the glue squeeze out in preparation for finishing. Door fit to the opening – I’ll remove more material once I’m sure what hardware I’m using. Speaking of finishing, I have some scraps of White Oak in a fuming out in the shop now. I pulled one piece after 3 hours and it was too subtle. After 7 hours I pulled another. It’s darker, but still too subtle. It also has a greenish cast, but I think that’s expected. More on that later. The next big thing on this cabinet is to make the glass panel for the door. I’m using a Dard Hunter design for this. 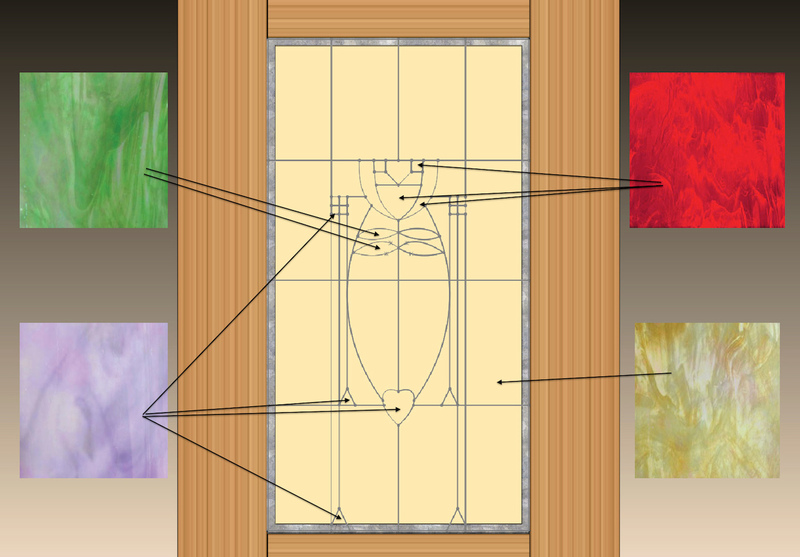 To get the layout for this I started by updating my CAD model of the door that I did to figure out the joinery. I made it as accurate as I could, then I imported the design as an image and essentially traced over it with lines and splines. I’ll print out a full sized pattern at Kinkos on their large roll printer, as it’s a little larger than I can print on my home machine. I picked out the glass that I want to use and ordered it today, hopefully it will come before next weekend, but I’m not holding my breath. I’m going to do this using the copper foil (or Tiffany) method because that’s what I know how to do, although using lead came would be more traditional. I’ll try the “leaded” approach some time, but I don’t want to mess with it now. My guess is that leading would be way faster then foiling all of the individual pieces and soldering all of the seams. I had a pretty good day in the shop yesterday and was able to glue up the door. If you have followed my previous escapades you’ll know that I bolloxed the first attempt. You’ll also know the achieved plausible deniability and was able to blame it my mortise chisel. Yesterday I was able to chop four nearly perfect mortises and move on to cutting the weird staggered tenons. As a footnote, I’m still not happy with the Sorby mortise chisel, I had to sharpen it twice while cutting the four mortises. I probably could have pushed it through all four mortises, but the edge was knocked and rolling over and I was afraid it would push it off course or cause a split. I’ll need a better solution before I mortise more. I was concerned about how to get the rails cut to the correct length so that the door would be the correct width. My experience tells me that measuring the stiles and subtracting them from the door opening, then adding in the planned lengths for the rebate and mortise leads to tolerance stack-up and it’s not exact enough. Instead I laid the two stiles in the door opening, and knifed in the remaining width on a scrap of fine. I cut this to length so it was just slightly oversize, and checked it at both the top and bottom of the door opening. This gives me the target width for the exposed face of the rail. 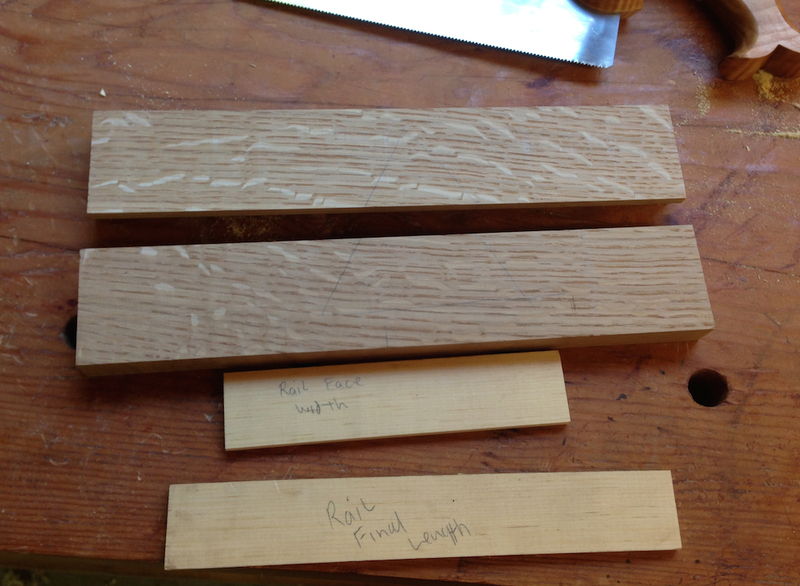 Then I added in the mortise and rebate widths, times two, to get the overall length. This gave me the final cut length for the rails. Over-long rails with story sticks for the face length and overall length. 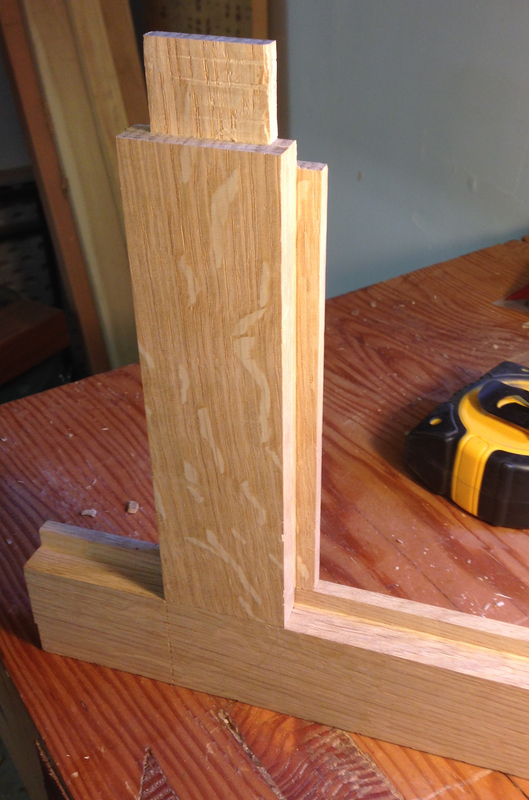 With these two story sticks I could lay out the final width, the shoulders for the front of the tenons and then measure the offset for the rear shoulders…and double check everything before cutting. 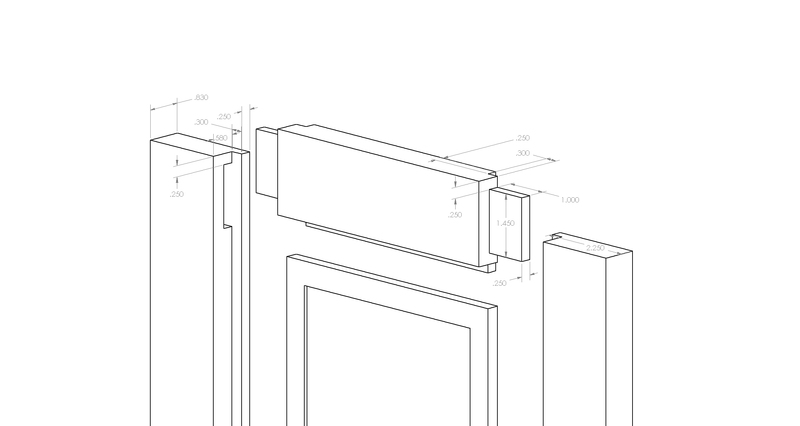 In the end I’m shooting for a door that is just slightly too large, maybe .020″ to .030″, so I can plane it down and get the gaps exactly right. When I’m a little more confident in making inset doors I’ll probably shoot for an exact fit with a shaving or two to dial it in. In the end I was successful. The tenons were slightly over thick, and a shaving or two off the back (to keep the alignment of the fronts on track gave me a nice snug fit that took a light touch with a mallet to seat (and take apart). The front and back faces were flush, the joints square and not exposed, and the assembled door lays flat on the bench with no twist. Joy in Mudville. First joint test fit, check out the nice alignment with the cut lines on the stiles! Since gluing up with Old Brown Glue is something more of a process than just grabbing the glue bottle (I heat up a glass of water to warm the glue) I try to do all of my gluing at once. I added walnut Miller Dowels to the case sides to reinforce the rabbet joints, and I also cut thin strips to fill where my earlier mistake led a gap at the corners. I made the rabbet at the back of the case deeper than the rabbet at the corners, which left about a 1/8″ gap. The repair should be invisible and certainly won’t cause any structural problems. Dowels and corner repair glued in place, I’ll flush these up today (and yes, I managed to glue this on in facing the wrong way. Crap. I’ve never used Quartersawn White Oak before, so I’m experimenting with some different finishes. I’ve done two samples so far, using a combination of Aniline dye and gel stain. 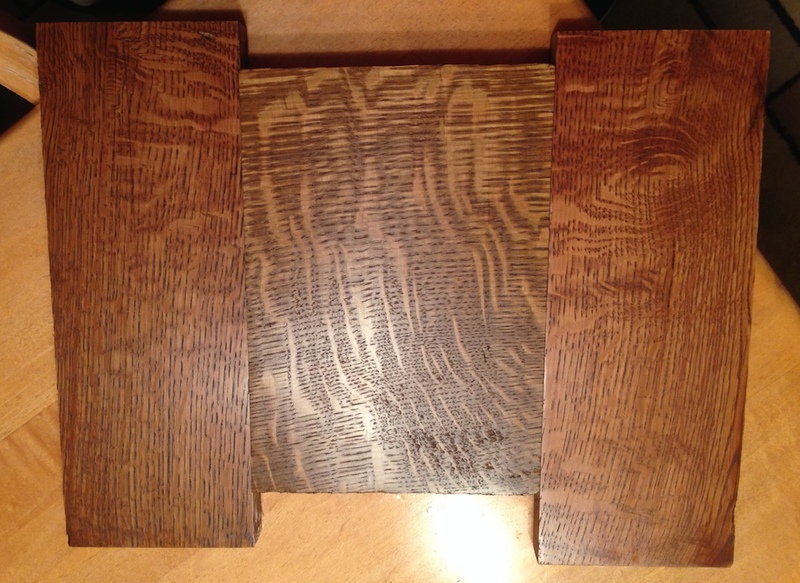 The sample on the left was dyed with Brown Mahogany first, then stained with General Finishes “Candlelight” gel stain. 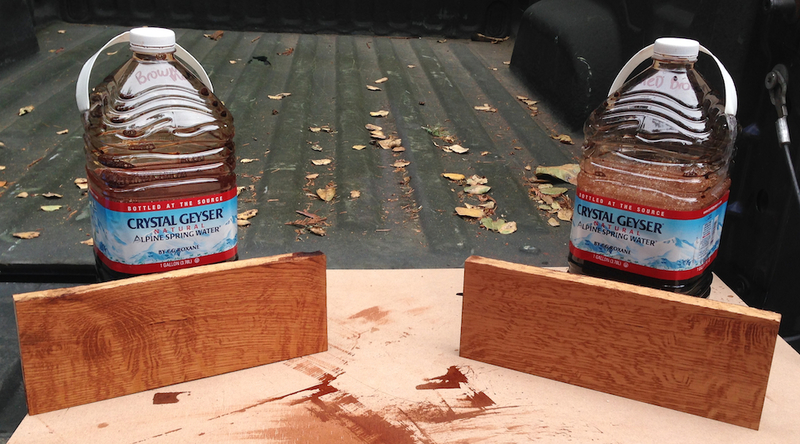 The sample on the right got Medium Brown aniline dye followed with Walnut gel stain. I top coated with two think coats of blond shellac, rubbed out with 0000 steel wool and waxed with a brown wax. I want a little more contrast between the ray flacks and the rest of the board, but this is pretty good I think. If I let the dye dry overnight and then rub the surface with steel wool or a scotchbrite pad I think the way flecks will lighten up a bit more — they don’t seem to get any color from the gel stain. I prefer the color of the left sample, it has a little more red in it. I’m going to try fuming a sample with ammonia too (followed by a coat of linseed oil, garnet shellac and brown wax) and see how that comes out. After a bit of remedial mortising I’m back working on my Byrdcliffe-inspired cabinet. First off, I picked up the materials for finishing, but I’m not sure on the exact approach I’m going to use – so I’m making up some finish samples. I found this article online that has some some different mission-style finish formulas using a combination of aniline dye and gel stain. I’m making up samples of the #4 and #5 examples. I want the quarter-sawn figure to really “pop”. So far it’s not. 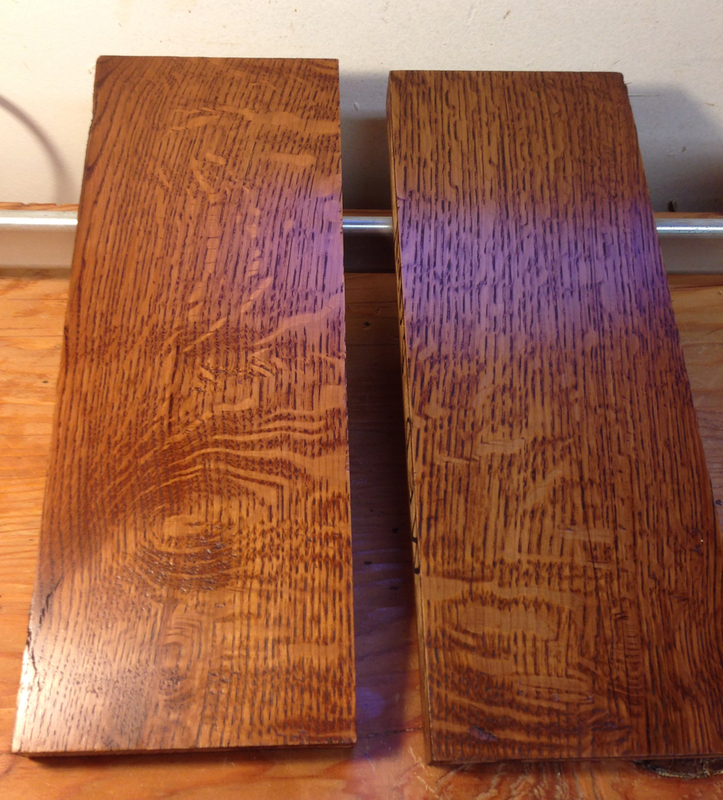 The dye seems to color the oak pretty evenly. After this drys I’ll put a coat of gel stain on each and see what it looks like. Plan B is to fume it, oil it, topcoat with amber shellac and then brown wax. I’ll need to pick up some ammonia and start a piece fuming so I can compare it. While I’m waiting for my samples to dry I’m working on the door for the cabinet. I milled up new stiles to replace the ones I screwed up before. 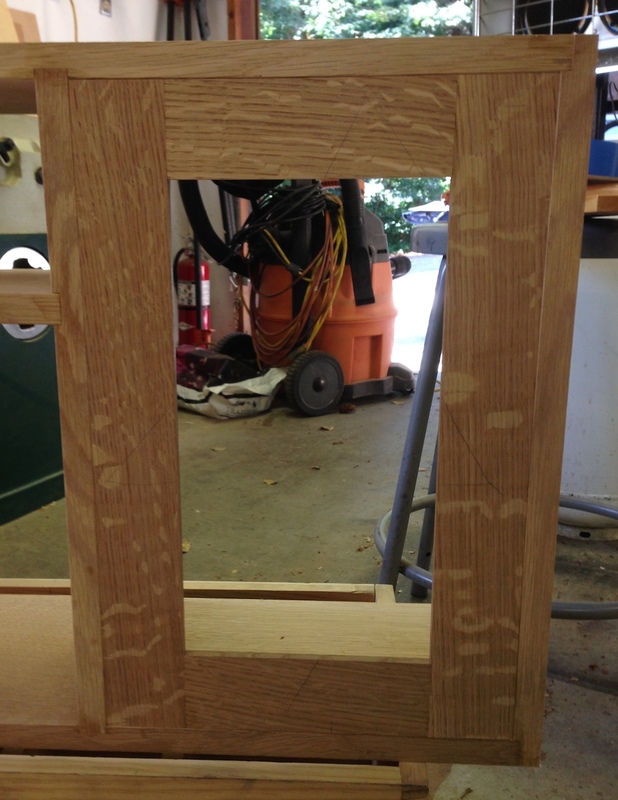 And yes, I left them long to prevent blowing out the ends when I mortise and assemble the door frame. 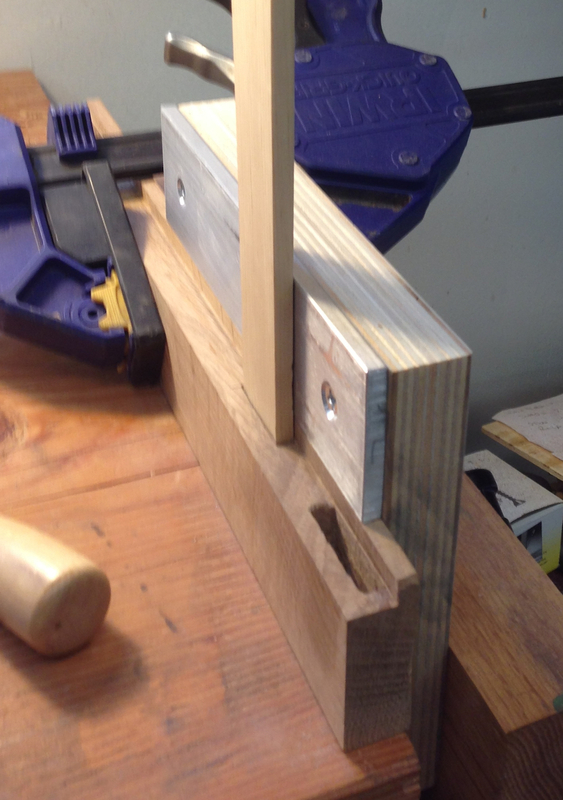 I also made a small fixture to help keep my mortise plumb. 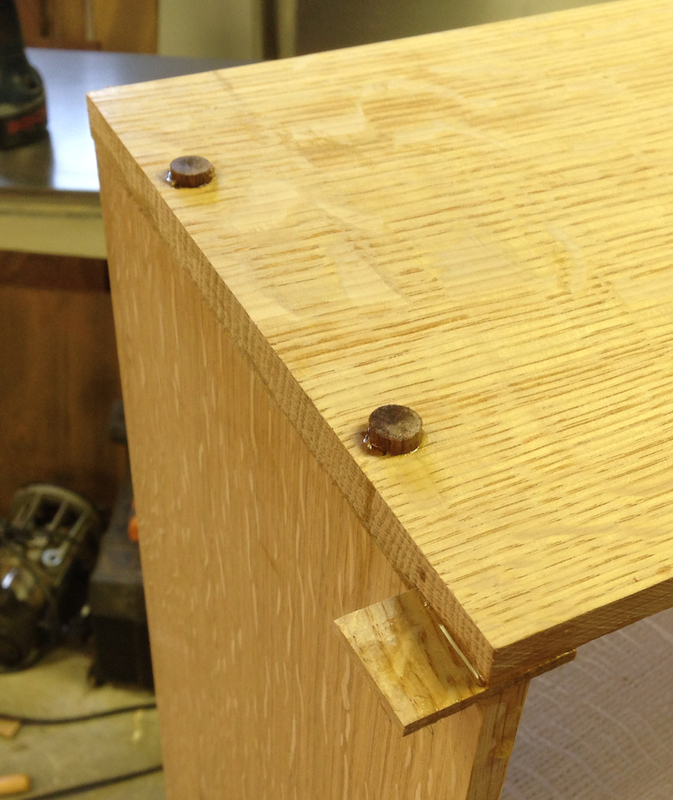 I did one more practice mortise to “warm up” and make sure the fixture would work as I expected. It did. 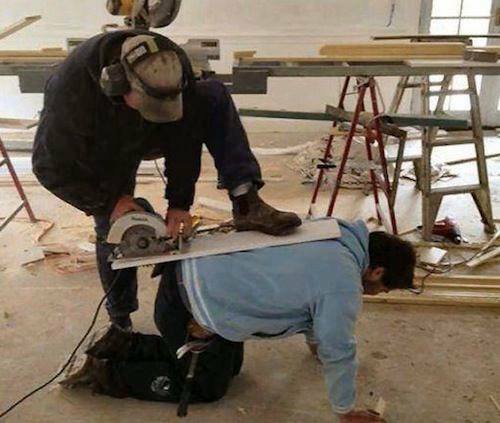 These guys are doing something inherently unsafe, they really need to be wearing proper safety glasses. Dude, put your safety glasses on before picking up a power tool! 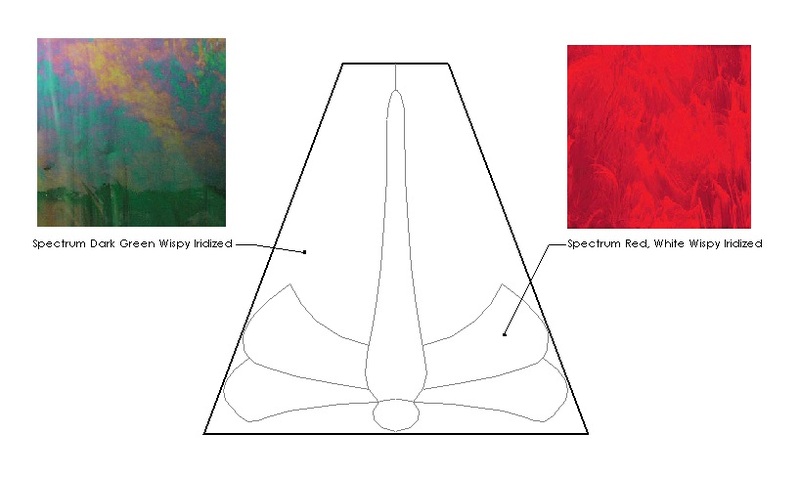 After reading through Jeff Gorman’s articles on mortising I realized that having geometry problems with my chisel would cause the kinds of prelims I was seeing with crooked mortises I was experiencing. I thought I should do a little research out in the shop. To back up just half a step, I was having a couple of different problems with my mortising. 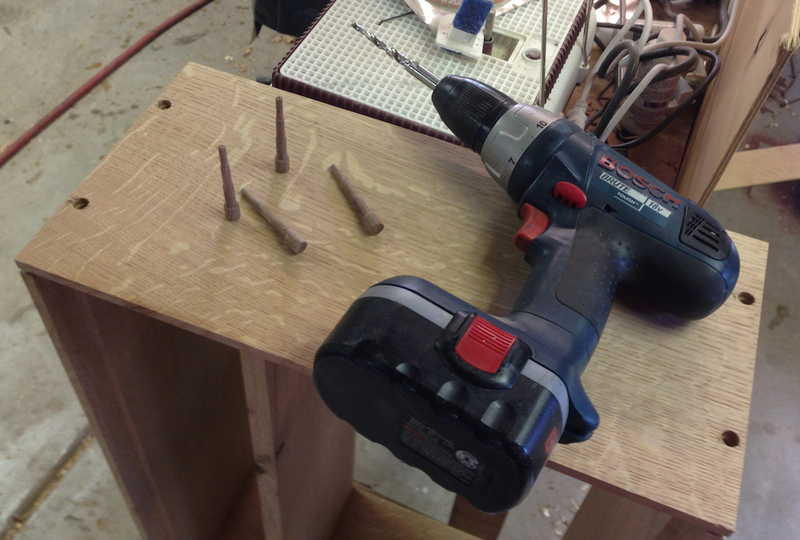 First, and the easiest problem to solve was that I was blowing out the ends of my mortises. That, frankly, was a self-inflicted injury. I’ve read Wearing, I know that I’m supposed to leave the door frame members that are going to get mortises over-long to prevent this. I’ve already milled new stiles for the Byrdcliffe door that are four inches over my finished dimension. I’ve also realized that I can control where the chisel moves by how I orient the bevel — the chisel always pushes away from the bevel. In hindsight I probably could have chopped those mortises 1/4″ from the end of the stiles with a little more care (and the bevel facing the end of the mortise/end of the stile). 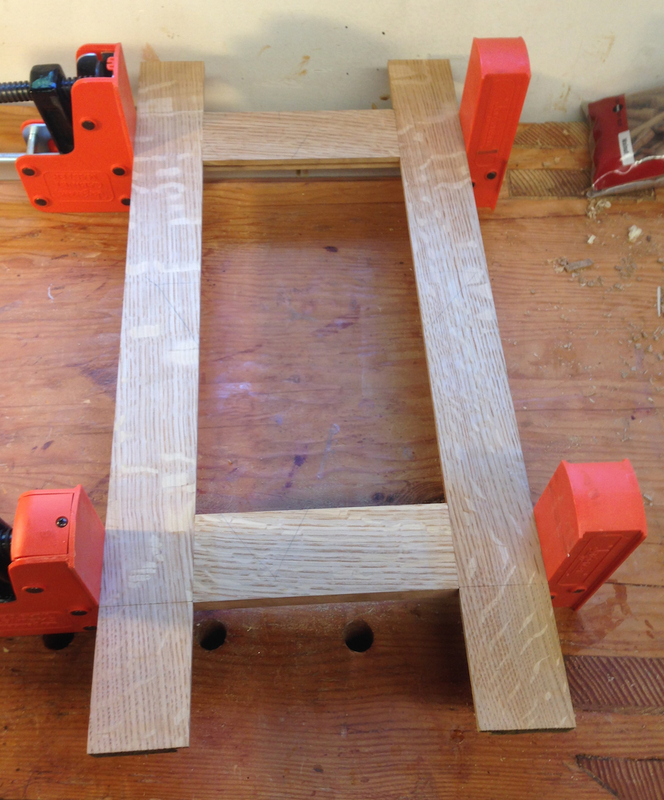 The other main problem I was having was that my mortises weren’t straight or plumb — that is the tenon would lean toward the rear face of the stile. Part of the solution is to orient the workpiece so I’m looking down the length of the mortise and can watch to ensure the chisel is plumb. But I gotta tell you, I was doing that and still getting mortises that listed to the starboard. On top of that, the stiles have a shoulder – a rebate for the stained glass I plan to make – that I was using to ensure that the chisel was straight. While I was chopping the mortises I notices that my English mortise chisel was getting stuck and I suspected that there was a fatter part behind the cutting edge (no not *me*, not that far back, closer to the edge). So I measured it, guess what I found? I found two serious problems with my chisel geometry. 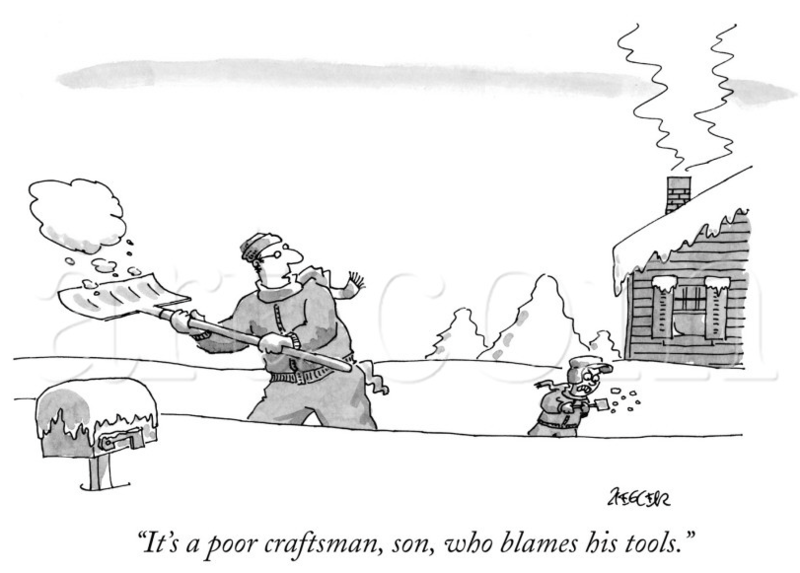 And yes, I know that “it’s a poor craftsman that blames his tools”. But there are two very real problems here that I found. The first is obvious from the tracing of the chisel above, the cutting edge is not straight. Its angled to one side. That makes it a sideways wedge and it will push the chisel to the side in the same was as the bevel of the chisel will push it back. The other problem is less obvious. You can see from my measurements that the chisel is narrower at the tip than at the midpoint of the bevel (or anywhere, really). What isn’t obvious is why — someone kissed the side of the chisel on a grinder and the one side of the tip tapers in. 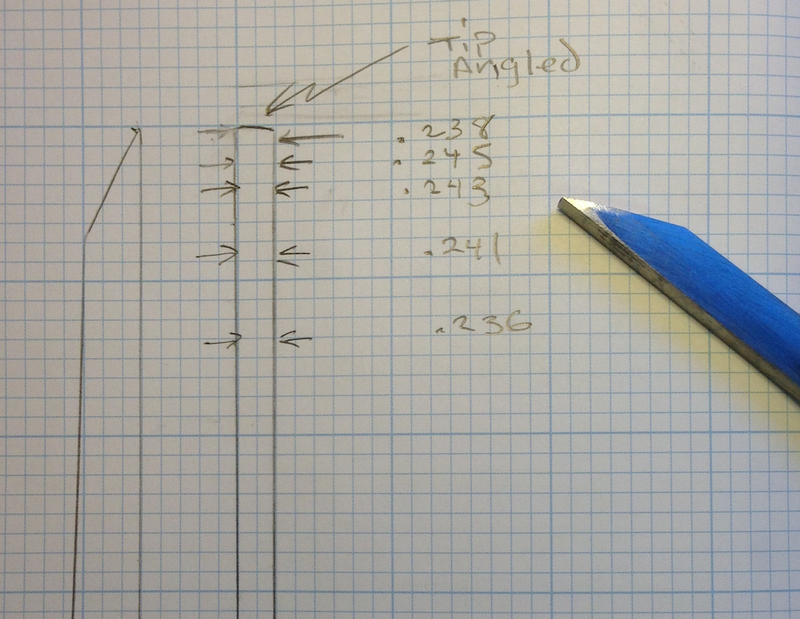 Guess what, another wedge shape that pushes the chisel off plumb. 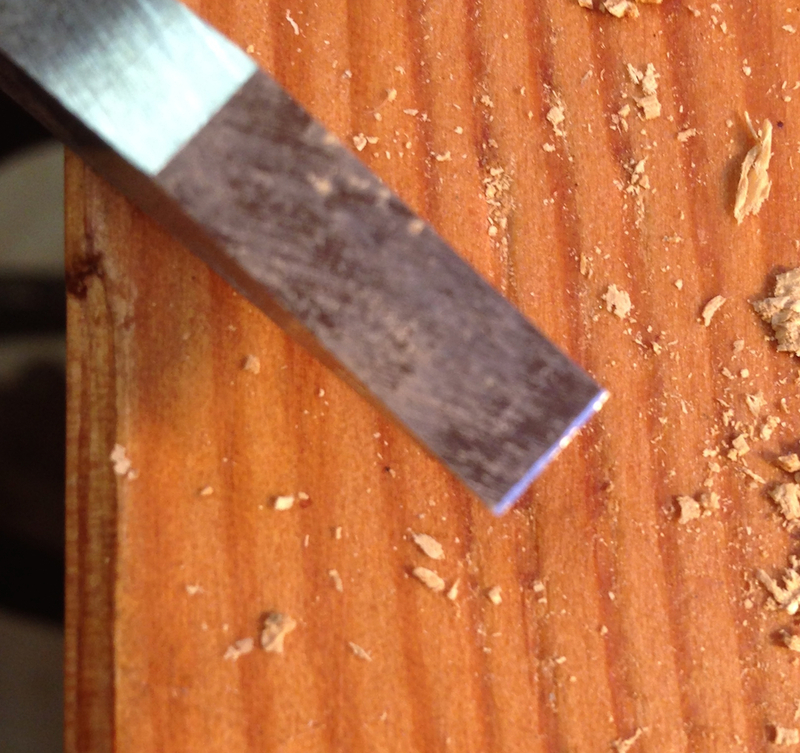 I can easily re-sharpen the chisel and get rid of the first problem, but correcting the side-taper means shortening the chisel by 1/4″ or maybe a little more. In the meantime I had to run out to Woodcraft to pick up some Aniline Dye and Gel Stain for the finish work on this project, so I bought a Sorby mortise chisel. Long story short, it works well and chops a nice straight mortise, but I hate the plastic handle and I’m not impressed with its edge holding. 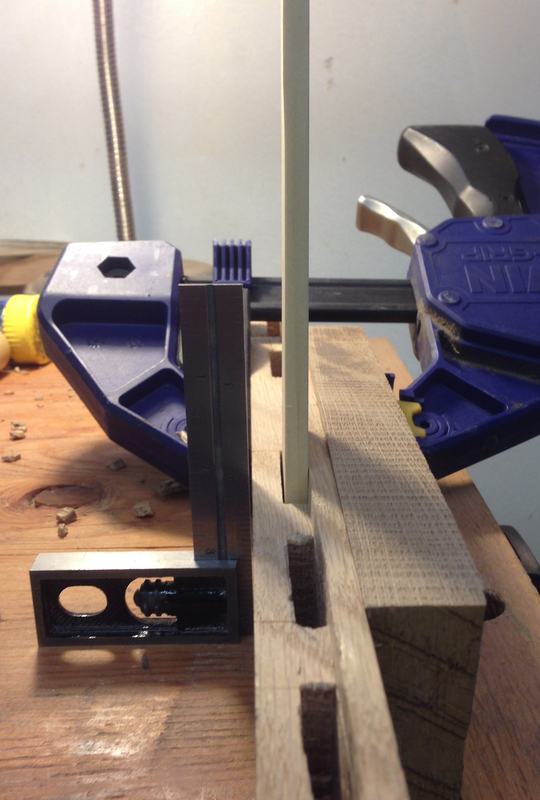 I laid out another practice mortise, and chopped it using the end-to-end strategy from Paul Sellers’ video. 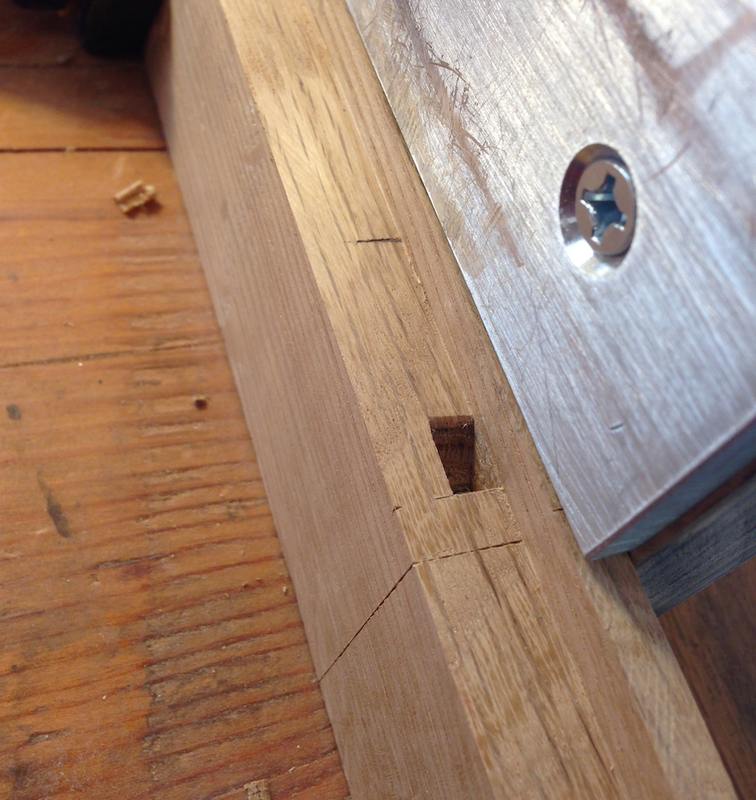 I ended up with a straight, smooth, square mortise a bit over my intended depth. Wow, what a relief. 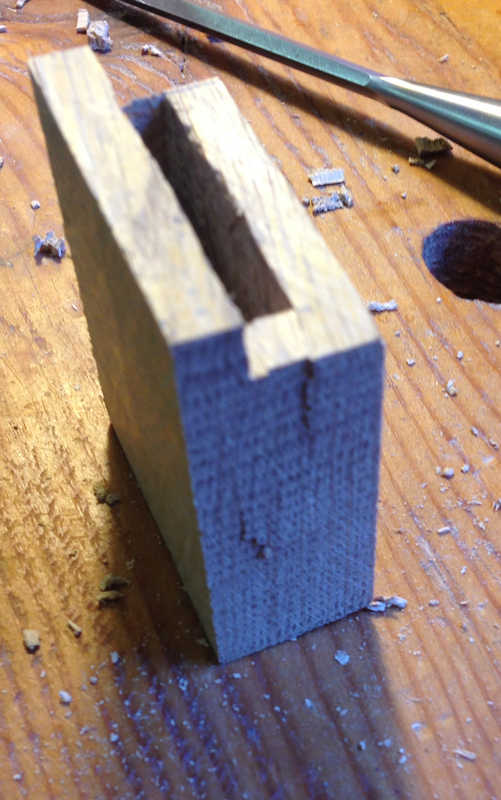 A “true” mortise chisel makes a big difference. Any straight and true chisel would work. 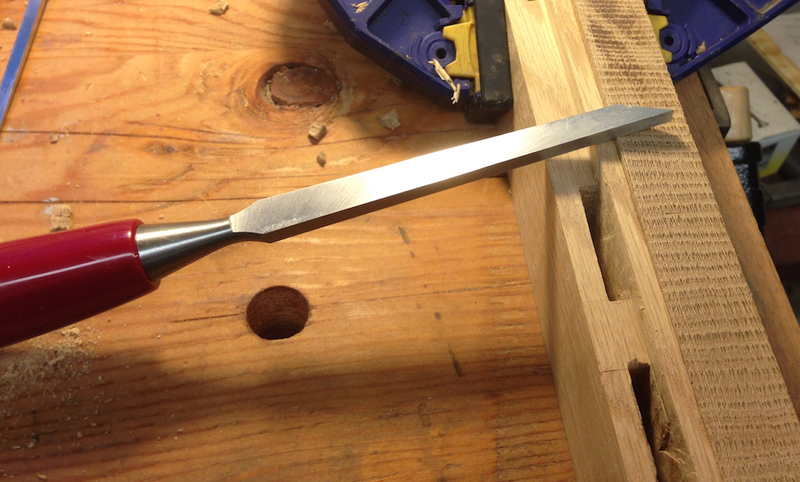 Here is what I like about the Sorby chisel. It was in stock at the local Woodcraft store, and is ground straight and true. It wasn’t cheap, but at $40 it is not unreasonable. Here is what I don’t like about it. The plastic handle is just god-aweful. God-Aweful. Ick. The steel is questionable. The chisel was sharp out of the package, including a micro bevel, so I went directly to chopping my first mortise with it. After one mortise (and gentle taps, I’m not wailing on this thing for God’s sake) the edge has a couple of little nicks. It wasn’t badly nicked, and I could certainly cut another mortise with it before sharpening, but I don’t want to sharpen it that frequently. I flattened the back (it was pretty close) and worked it through up through my 13,000 grit stone. 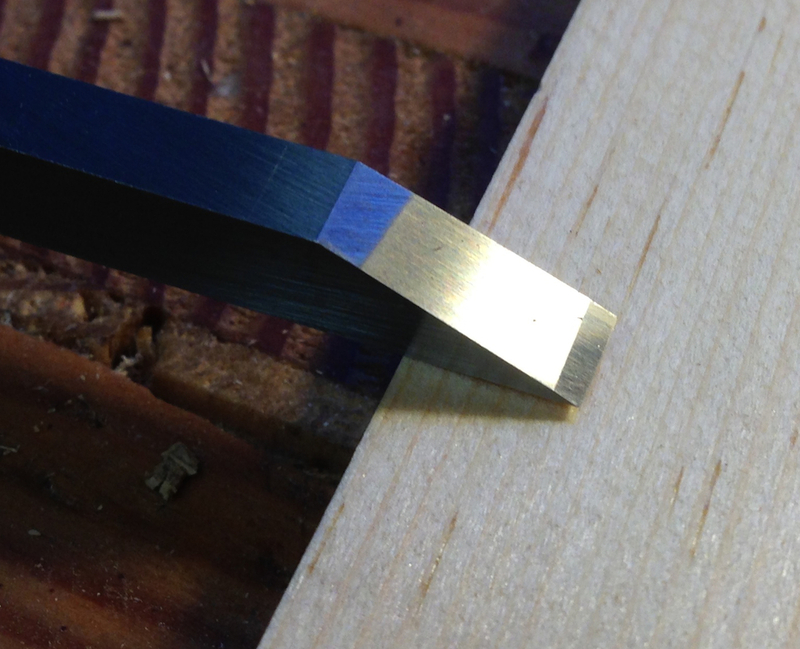 Then I flattened the bevel and added a micro bevel with a polished edge. My thinking was that even though the chisel was sharp, with the factory scratches it wasn’t working as effectively as it could. 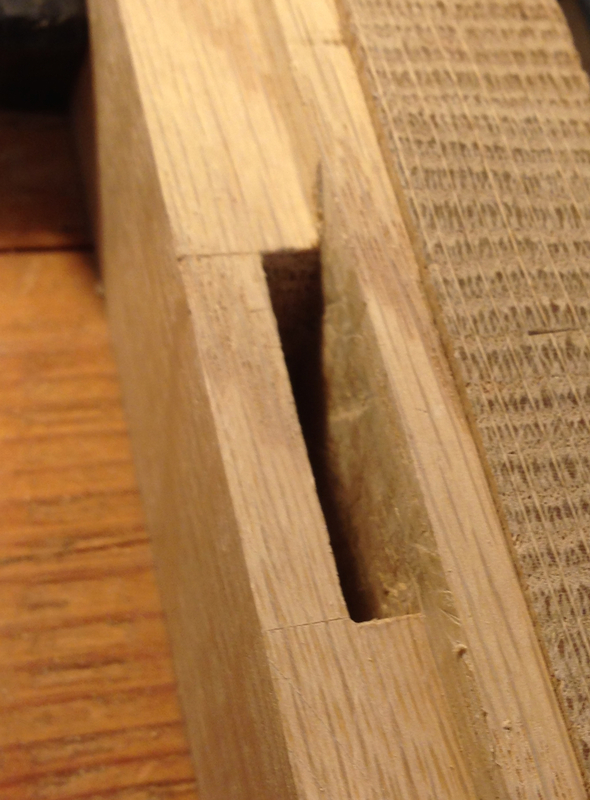 The second mortise was easier, but the edge still showed wear. I might get four mortises out of it before I need to re-sharpen. 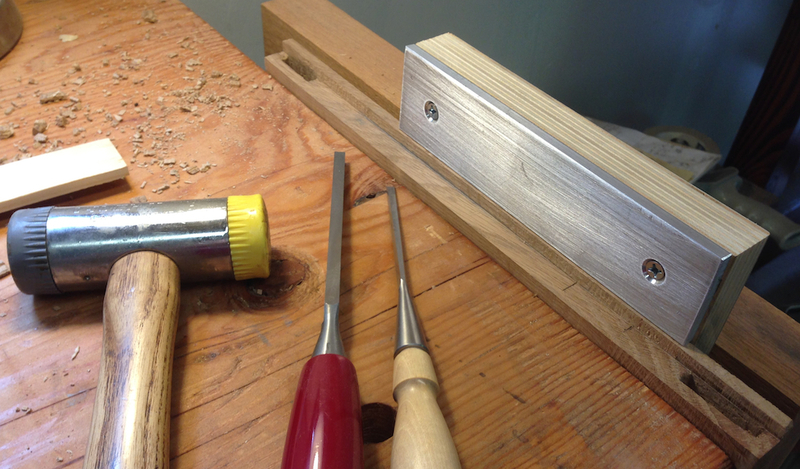 With my old chisel I cut a dozen practice mortises without it showing the same level of wear. The bottom line is that I think I’m mostly out of the woods on making the mortises for this door. I have to say, that feels pretty good. I’m no mortising god, not by anyone’s measure, but things are looking better. I’ve been using a “test tenon” to check my mortises, both to make sure the floor is flat enough that they don’t rock, and that the mortise is snug and plumb. Even though it looks like there is a small gap on the left side, it’s nice and snug — and clearly straight. I should be able to get my door frame this weekend, in fact I can probably finish up most of the woodworking on the project and start planning the stained glass.